Trello is a visual collaboration platform that gives teams perspective on projects. Trello can be used to organize, collaborate, communicate and coordinate on projects and assignments. Trello is great for a variety of work, educational, and personal uses, from school bulletin boards, lesson planning, collaborative student research projects and task management to planning and organizing your next vacation with your family. The best part is Trello’s collaboration-ability – boards can be viewed, edited, and managed by multiple members so classrooms, teams, or families can keep track of everything and everyone in a really intuitive and visually appealing way! There are more than 12 million active users on Trello, and there is at least one employee in 70% of the largest companies in the U.S. currently using Trello. 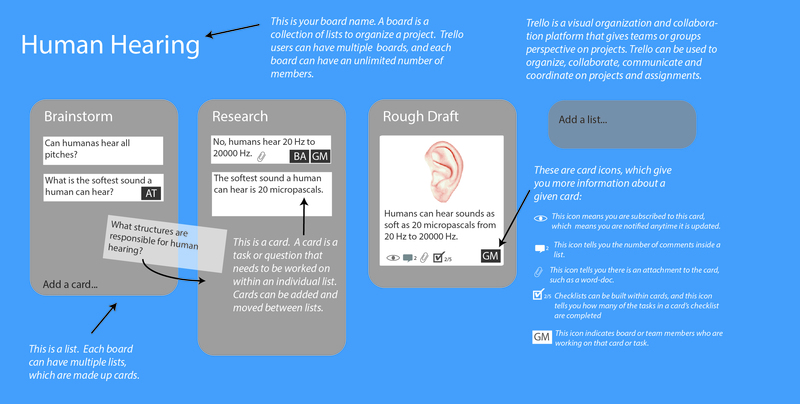 Trello users create boards, lists, and cards. Boards can be shared by an unlimited number of team members or collaborator. Each board is a single web page which displays lists for that board laid out horizontally on the page. Cards are the items which make up a given list, and cards can be dragged and dropped onto other lists or reordered within lists. Each individual card can be comprised of a variety of things, including images, attachments/documents, deadlines, and notes. While Trello may seem like a great tool to keep your own life organized, it has a ton of applicability in the classroom that might surprise you! Trello is a great tool for project-based learning. Students can use Trello to take control of a project and outline the steps needed to bring it to completion. They can split up tasks and plan what they need to meet goals. They can move cards around as needed, or as pieces are completed, and you can track their progress in real time as they go! You can even go in and set deadlines for individual components, which may help those procrastinators in your classroom. It is a great tool for synchronous or asynchronous communication, active learning, cooperative learning, and conducting research. Substitution: Students collaboratively use Trello to list the steps to complete a project (as opposed to writing it down on paper). Augmentation: A large group of students can organize and plan an individual project simultaneously and remotely, including assigning responsibilities to individual members. Elementary School (Grades K-5): Have a Trello board or list for each student. List student goals on the Trello board each week, and make each student responsible for adding a card outlining how they achieved that goal, or what they need to achieve that goal. For example, if you are working on a cooking project with your student, the goal may be to follow and implement a cooking recipe. Students may need to use their knowledge of fractions to achieve that goal, or work on their fractions more if they struggled. This would be included on their card for that week. Have parents subscribe to their students’ board to track their progress. Middle School (Grades 6-8): Have a group of students brainstorm a question, then work through a Trello board template of steps defined by the teacher to answer that question. This project based learning model could walk students through brainstorming a question, doing research on that question, outlining the key facts from that research, and drafting sections of a paper, creating a youtube video, ora presentation about what their question. Require each student to add a certain number of cards to each list through the process. High School (Grades 9-12): Have each student create a Trello board listing the standards that they will learn in that class year. The rest of their board will have lists with topics such as what they 1) are currently learning, 1) are studying to be assessed, 3) have been assessed, and 4) have mastered. For example, a high-school algebra course may include standards such as “Order of Operations”, “Understanding Inequalities”, “Scientific Notation”, and “Squares and Square Roots”. Have students be responsible for moving cards of standards through this process as they go, and adding documentation to those cards as they progress through each phase. Higher Education: Have each student create a Trello board to organize their process in writing a research term paper. Assign each student two peers who will be viewing and editing members of the students board, who will assess and analyze the students’ process through the Trello activity log and provide feedback and suggestions. Trello users create boards, lists, and cards. Boards can be shared by an unlimited number of team members or collaborators. Each board is a single web page which displays lists for that board laid out horizontally on the page. Cards are the items which make up a given list, and cards can be dragged and dropped onto other lists or reordered within lists. Each individual card can be comprised of a variety of things, including images, attachments/documents, deadlines, and notes. If you want to use your board collaboratively, first select “Create a team” and create a team name and description (e.g. 10th grade Science). Click on “Create a new board…” to create your first board. Give your board a title. For example, if you are going to have your class research Human Hearing, that is the title you might give your board. Select what team, if any, this board will belong to (e.g. 10th Grade Science). Boards are made up of multiple lists to organize a project. For your Human Hearing project, you might start with a list called “Brainstorming”. Lists are comprised of several cards, which can be tasks or component of that list. Within your list, click “Add a card” to add your first card. Edit the description of the card. Add a comment to the card. Add specific members of your team to the card. Add checklist items within that card. Add a due date for that card. Add an attachment, like a document or an image. If you add an image, it will appear directly on the card in your list on your board.